I too struggle with whether or not to give money to the homeless people on the corners. I work on a trauma unit as a RN, which means I, like you, have seen the criminals, the drug addicts, the “crazies”. It has made my heart a bit harder, I have to admit, but I still want to volunteer at the shelters when I can, and I hope to help in that way. A few days ago, my daughters and I were passing by a homeless man at an intersection not far from our home in Nashville. He was dirty and unkempt, I am certain from hours standing in the heat on the corner. He also seemed a little off–you know, not quite playing with a full deck… which isn’t all that unusual with homeless people. We all three watched as people ignored him, shooed him away from their cars. Quite frankly, I was getting ready to do the same. Having worked on “crackhead row” in Chicago (off Cicero and 47th), I had become hardened to so many folks begging at the light–especially when I had experienced one becoming belligerent when I offered him my untouched, just bought lunch. (He wanted money instead.) I was ready to move on like everyone else at the light, when my children intervened. This is a great infographic. Makes me a bit concerned about my lack of sleep on work days, but I have not choice, since my work days are 13+ hours, and there is just not enough time to sleep when I am home. Sleep is one of the most important and at the same time one of the most one of the most overlooked aspects of our life in conversations about good health. I have written a Page on it – How Important is a Good Night’s Sleep? This is Artemis, well Artemis the cat that is. 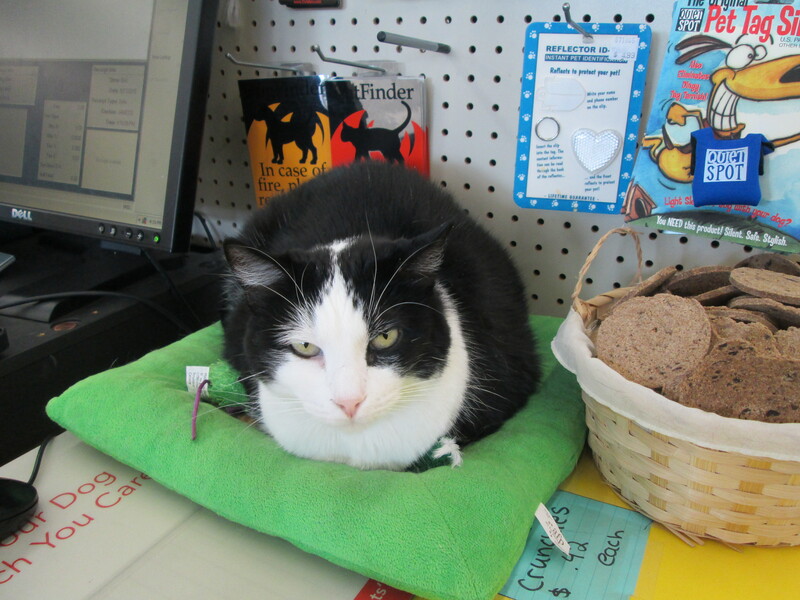 Artemis was a stray cat who wandered into a feed store one day and was quickly adopted by the staff there. That was over 5 years ago, and she is now quite the celebrity. Most customers are familiar with her, as she frequently wanders over to say hello as you browse the shelves. Artemis now lives in the store full time, and is cared for by the staff. We always look for her when we stop there and give her a scratching behind the ears, which she loves. Her name comes with a bit of Greek history. According to Greek Mythology.com, “Artemis was the goddess of chastity, virginity, the hunt, the moon, and the natural environment. She was the daughter of Zeus and Leto, twin sister of Apollo. She was born on the island of Ortygia (Delos), where Leto had found shelter after being hunted by the lawful wife of Zeus, Hera. As soon as Artemis was born, she helped her mother give birth to her twin brother, thereby becoming the protector of childbirth and labor. She asked her father to grant her eternal chastity and virginity, and never gave in to any potential lovers; devoted to hunting and nature, she rejected marriage and love. She was the protector of nature and the hunt; both wild and tame animals were under her protection. She also protected the agriculture and animal herding”. That is quite the name to live up to, but Artemis the feed store cat does it pretty well! She stalks around the store, watching what the customers are up to, and when the day is done, she rests in one of many of her perches to await the store opening the next day. 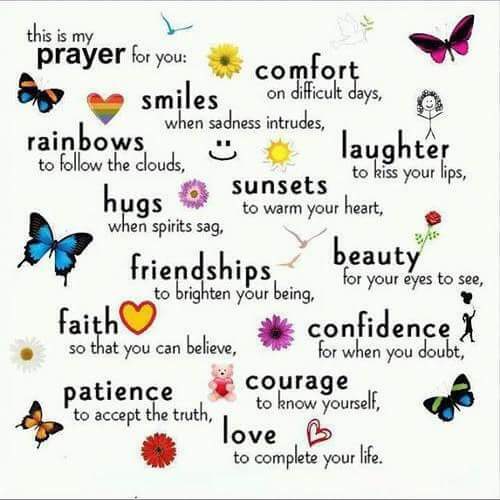 Love it, the simple things that make life sweet…. I remember those feelings of being on the road for more than a month. At one point our family had been away from home for more than 2 months on a work/vacation trip. We were staying in long term hotels, and tried to make it as homey as possible for the kids. They did enjoy seeing new things and meeting people but they sorely missed home. The longest we were ever gone was only 2.5 months, but that was long enough for the kids! I think it would have been different if we were to stay in a home setting while traveling but my ex-husband’s schedule was usually a few weeks at one place, then move to another. That was hard, but we really managed to see a lot of the U.S. It comes in waves. Today is a bad day. We are seven months or so into our travelling adventure and I’m aware that each bad spell feels a little harder; each new start after visitors have left takes a little more energy. Poring over maps feels daunting rather than uplifting on days like these. We’re in Istria still and have been here for around three weeks. After Rob’s parents left us near Trieste we had a couple of weeks to kill before our friends, the Parry family, were due to visit. Hanging around without a clear plan, with very little money for fun or luxury camping, kills momentum. We struggled, or rather I, struggled. The many frustrations of living a life within a few square metres were getting to me, along with grumpy children and nowhere to escape to. On a bad day the list goes on and on. Abroad at Home, by National Geographic. This is a very interesting read, and highlights places to see in America which provide an international experience. I love the way it is divided into the various regions of the U.S., with detailed instructions on where to go and when certain festivals take place. The travel bug is biting again, and I have a problem: I just got back from a trip a few months ago. I am finding that that more I travel, the more I want to travel. Of course there is the practical side of working around my children’s schedules, the cost of travel, and so on. I find that the best thing for me to stave off the travel bug is to research for my next trip and to read about travel and other cultures/countries. On that note, I borrowed a few books from the library related to travel. 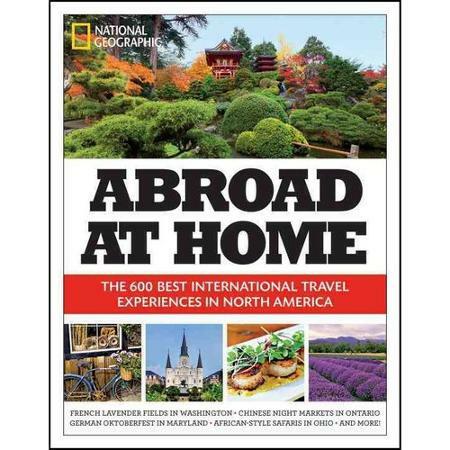 One I am reading now is National Geographic’s “Abroad at Home”, which highlights places in America which make the traveler feel like they are somewhere else in the world. I love that idea, since international travel is very pricey and just not something I can do right now. I have a few travel quotes I wanted to share as I believe they echo the thoughts of fellow travelers. Picture challenge, what is that?? 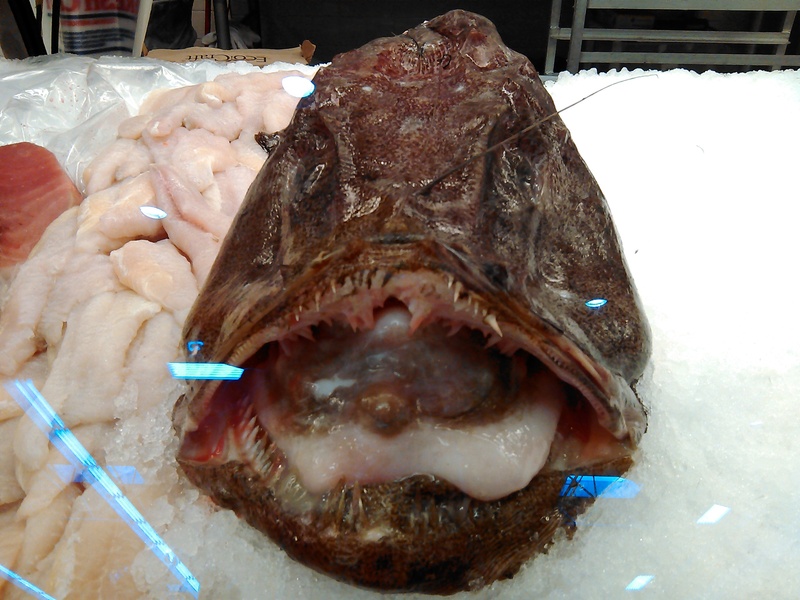 I took this picture at the seafood market of our local store. It was the ugliest thing in the case! I just had to share. I sadly forgot what type of fish the man at the counter said it was, but I know it is a bottom feeder. I also believe that it swims in the rivers and lakes here in Oklahoma, although I am not sure. I also learned it has three layers of teeth in order to open mollusks, which are part of its diet. Does anyone know what type of fish it is?? The tiny home movement seems to have hit Tulsa! 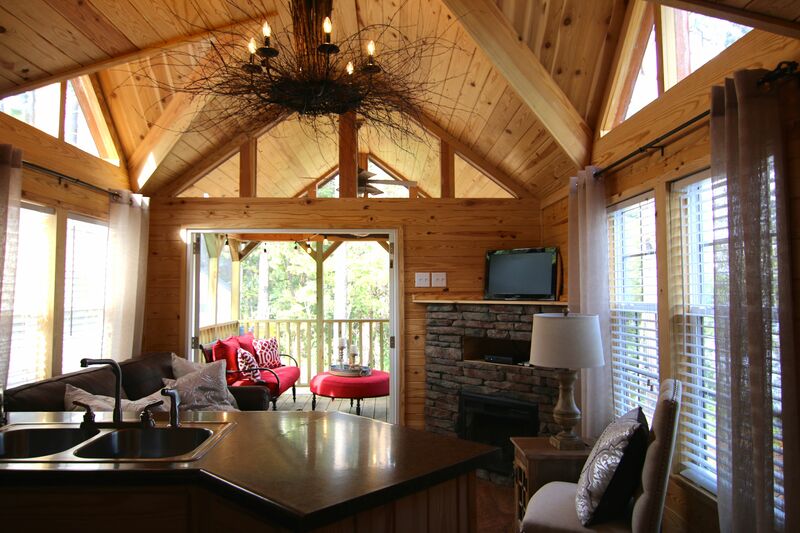 The homes I visited last week are constructed by the Rustic River company and I was curious to take a closer look. I had visited the site once before, but only one home was available for viewing at that time. Now they have five homes on site, and four are open to tour. 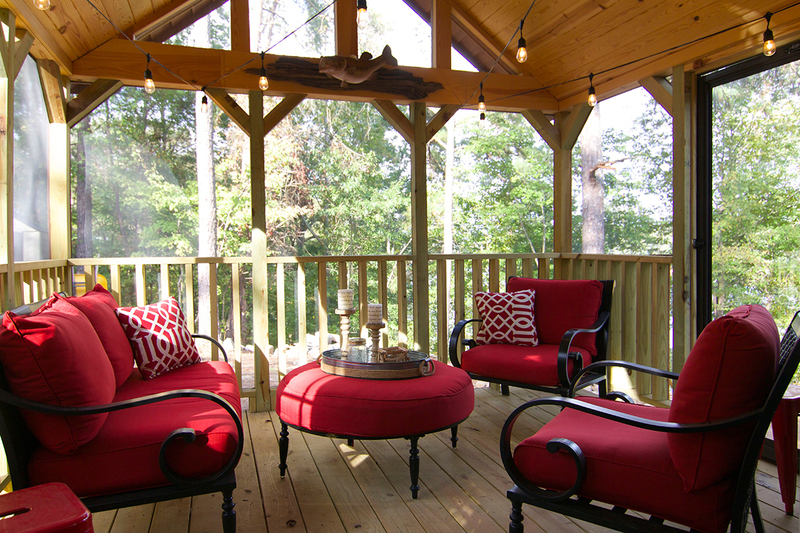 There a a variety of models, but the square footage is less than 500 square feet, unless you add the porch and the loft. The homes are unfinished pine inside, which would need to be sealed or painted, since the pine seems to get dirty very easily, as was evidenced by the shoe marks on the loft stairs in the homes. The outside seems to be a plastic/fiberglass siding (I am unsure of the quality, although it seemed as though it would not last very long). The appliances are all included, as well as a heat and air unit. My favorite was the model with a master bedroom, a very small bedroom with bunk beds, a loft, a full bathroom, a living room and a screened-in porch. There was a breakfast bar, but no room for a table. 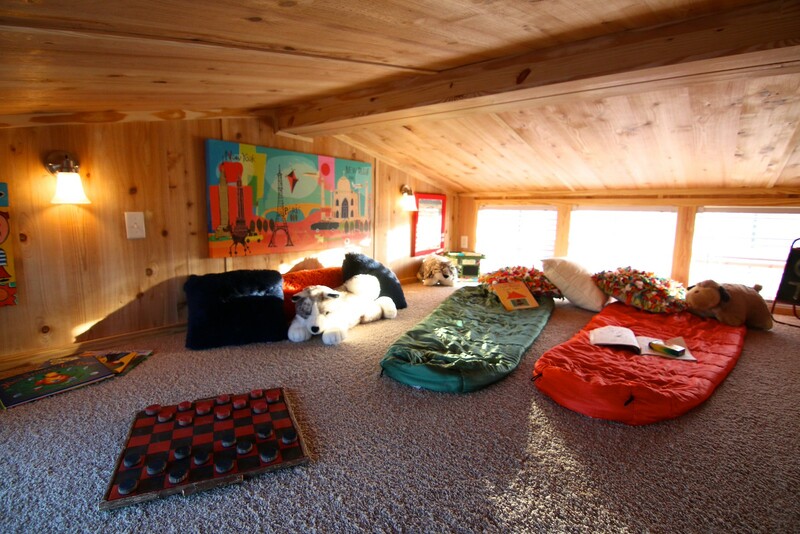 It was my favorite since it actually had two bedrooms, plus the loft could be an extra sleeping space. The cost was about $65,000, which seems a bit pricey. It would also need to be shipped to a mobile home park on onto land. 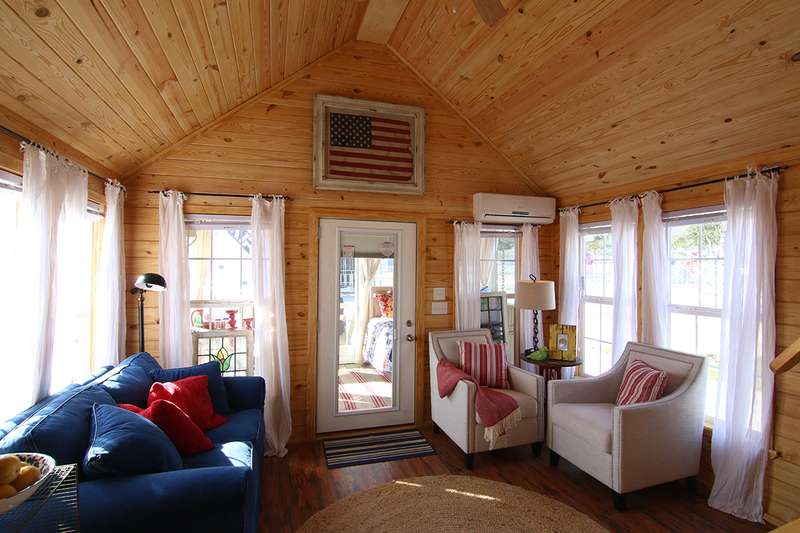 I recommend shopping around and paying attention to the materials used for these tiny homes. If I am going to purchase one, I would plan on living in it long term, and need the materials to be durable. Source Rustic River.com: the living area, very similar to the one I viewed, although it looks smaller in real life!